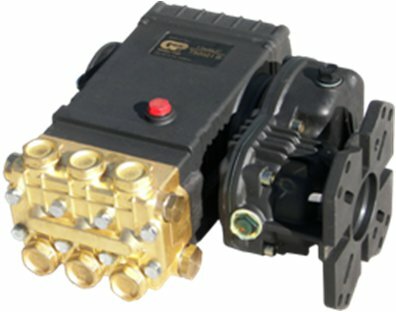 T Series 47, Triplex Plunger Pump with 1" Gear Box for J609B engine - Forged brass manifold with an exclusive lifetime warranty. Heavy-duty tapered roller bearings and oversized connecting rods for maximum life. Max. Inlet Pressure: 125 PSI Max. Fluid Temperature: 165° F Inlet Port Thread: 1/2" - 14 BSP-F Discharge Port Thread: 3/8" - 19 BSP-F Shaft Diameter: 1.0 in./25.4 mm Pump Dimensions: 12.2" x 9.2" x 10.5" Max. Inlet Vacuum: 9 ft. water (7.9 in. Hg) Crankcase Oil Capacity: 40.6 oz.